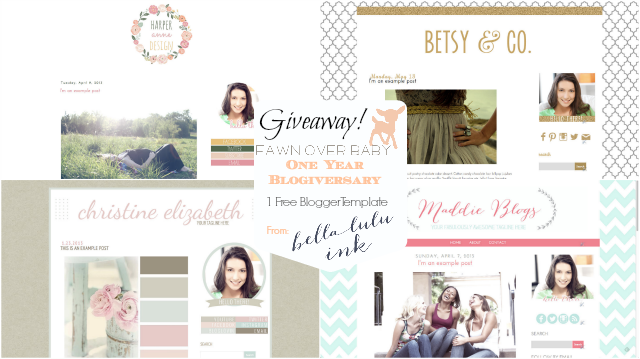 Fawn Over Baby: Fawn Over Baby Blog: One Year Anniversary Celebration + Giveaway! 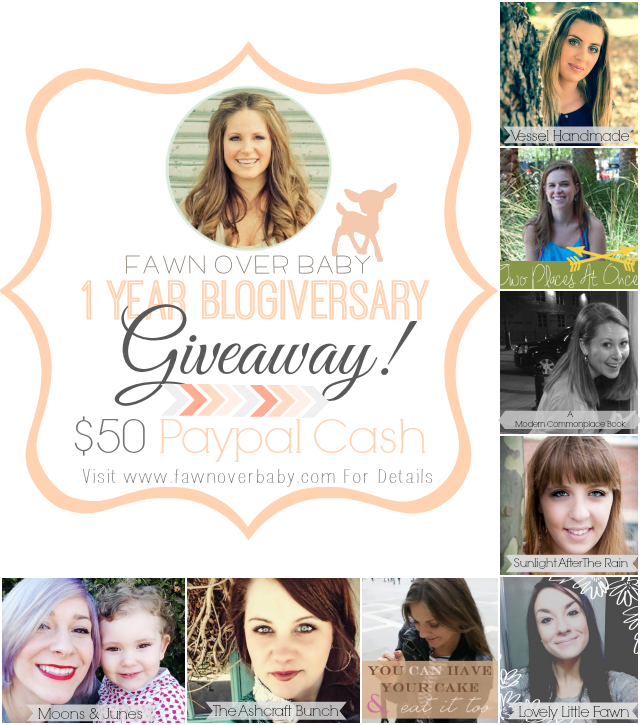 Fawn Over Baby Blog: One Year Anniversary Celebration + Giveaway! Where do I start!! 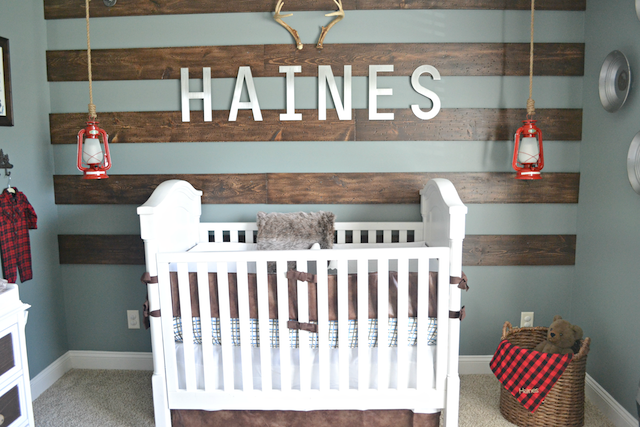 I guess I'll start with, how amazed I am that a year has already passed since my first blog post on Fawn Over Baby! When I first launched onto the blog scene, I had no idea what was to come of my little bloggy hobby. Through this wonderful journey, I've met so many incredible fellow bloggers, amazing photographers and creatively talented small business owners! I unknowingly stepped into an exciting online community that I'm so happy to be apart of! My blog has truly brought me so much joy and many wonderful friendships that I'm so thankful for. To celebrate how far Fawn Over Baby has come in just one year and to Thank Each and Every One Of You For Your Support and Readership, I am throwing a fun little GIVEAWAY Party and EVERYONE is invited!! I would like to Thank my WONDERFUL giveaway contributors! I'm taken back by the overwhelming support and generosity they have given me in honor of my One Year Blog Anniversary. It truly means so much and I'm so thrilled that they chose to share in this celebration with me. Its because of these talented bloggers and incredible shop owners that I am able to giveaway 4 AMAZING PRIZES to 4 FAWN OVER BABY READERS! This giveaway will run through Thursday of this week, March 20th 11:59 EST. I will announce our winners (selected randomly) on Friday, March 21st! I hope you are just as excited as I am and I wish you all the best of Luck!! To increase your chances of winning, you may fill out the rest of the form for extra entries. Giveaway will end Thursday, March 20th - 12PM EST. Winners will be chosen randomly and announced, Friday, March 21st! Happy Blogiversary! Here's to many more years of Fawn Over Baby! Thank you sooooo much Kelly!! I am most excited about the 1st two prize packs b/c I'm looking forward to having my first baby next month! Oh That's So Exciting! Being a mom is the best! 1 or 2 is the perfect giveaway for you! The first prize pack is fab! I would LOVE to win!!!! This is an awesome giveaway. 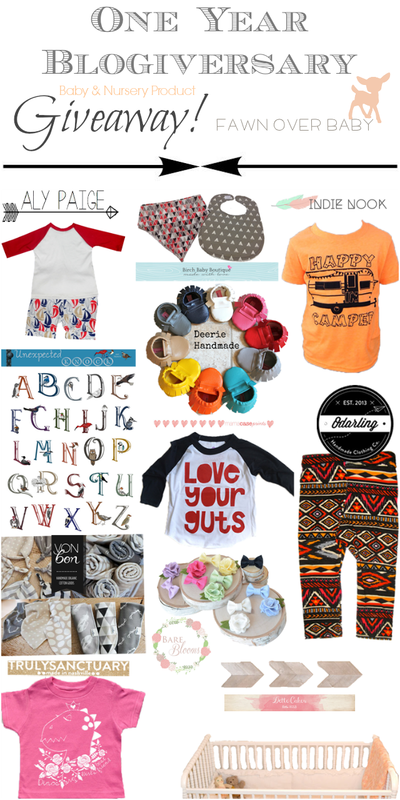 I absolutely love the love your guts tee and the mocs area super cute. I want to win it all. Love Your Guts Tee would pair perfectly with a pair of moccs! Thank you for entering Clarissa! Thank you so much Hannah!! Love your choice, such a cute tee! Thank you for entering! Loving the blog template! I'm just starting to blog(working on my first post now), I'll be featuring fun concept/mood boards from my interior design co for kids called mollieQUINN. The first definitely but I would be more than happy to get any of those amazing prizes! I hear you Andrea! They are all so fabulous! Thank you for entering today! This is awesome :) I love prize #1! Thank you Meghan!! #1 is fun! Good Luck!! Thank you for stopping by and for entering! I'm eyeing the $50 or the template! How fun! Wonderful Amber! Thank you for stopping by and for entering this fab giveaway! Thank you for entering! Prize 3 is a good one! Good Luck! $50 paypal cash! All of them are great though!! Cash is always nice :) Thank you so much for entering and Good Luck!! I would love the baby and nursery prizes!! Aren't they so fun! Thank you for entering and Good Luck! This giveaway is amazing! I would love the cash or any of the baby stuff for my little girl due soon! Congratulations on your soon to be new arrival! Thank you so much for stopping by and entering! Good Luck!! Happy blogiversary! Great giveaways! 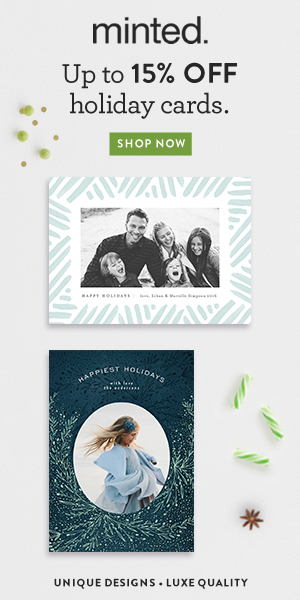 I'd love to win one of the blog templates they're so cute. They are all soooo adorable! Chelsea is so talented and an absolute sweetheart to work with! Thank you for entering! Good Luck!! I really love the I Love Your Guts tee and moccasins!! Love that combo! Thank you for stopping by and entering! All of the giveaways are incredibly generous and I would be happy to win any of them! But if I had to chose it would be #1 because I'm in love with the moccs! Moccs are the best! So easy to slip on and off baby feet! Thank you for stopping by and entering! I definitely have my eyes on that first prize bundle! So awesome! So awesome,right? Thank you for stopping by and entering! Everything I so neat. but I really love all of the little tee shirts for my girls!! My little one certainly has her fair share! We LOVE tees for littles!! Thank you for stopping by and entering! Good Luck! Awwwww thank you so much sweet friend!! I would love the first prize! Such a fun package! Thank you for stopping by and entering!! Good Luck! thank you for hosting such lovely giveaways! Oh no! I've heard that from a few people. I'm glad you made it back and your comment went through! Thank you for entertain (twice)! Good Luck! I would love the pallet arrow art, so cool!! Aren't they too cute Chelsea? I'm thinking about just buying them. Lol! Thank you for stopping by and entering! Good Luck! I hear ya! They are all great prizes thanks to the wonderful contributors! Thank you so much Jenn! Thank you for entering too! Good Luck! Moccs are our favs! So easy to slip on and off baby! Thank you for entering! Good Luck! those baby leggings are too freaking cute! thanks for the chance! They sure are!! We love leggings!! Thank you for stopping by and entering! Good Luck Mercedes! I'm loving the Aztec leggings, they're too much cuteness! They are all so amazing but prize pack #1 is my fave!